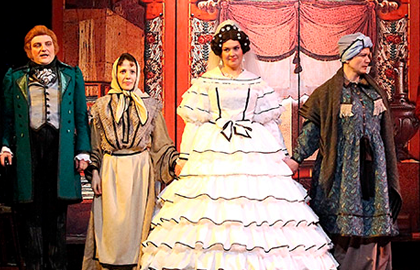 This comic opera based on a play by Nikolay Gogol is one of the most remarkable works of the Aleksandr Grechaninov – colourful figure in the history of Russian music at the end of the nineteenth and the first half of the twentieth century. He composed it at the age of eighty, when he was already in America and the piece was performed just a few times and only abroad. Russian premiere took place at the Natalia Sats theatre on 25 April 2009 and has won great acclaim among spectators and critics. The plot is founded on a young girl’s meditations on marriage and her actions, which lead up to and follow those meditations. The Heroine, desirous of marrying, invokes the aid of the Match-maker, the old-time matrimonial agent in the Russian merchant and peasant classes by conventional etiquette. The Match-maker offers for her consideration several suitable men, all strangers. Dynamic and an intricately woven plot, Gogol’s strikingly unique and inimitable style in combination with charming music by Grechaninov performed by young gifted singers make this production really interesting for both teenagers and adults.